Lutong Bahay is a short tag on the title which I use to feature home-cooked food, either in our own home or at a friend's house, either my own cooking or not. I've always loved cooking and eating pasta, but the usual carbonara or spaghetti had already got tiring for my taste buds. And then, I remembered a Pinoy fusion pasta I got to try from Chef Ivory Yat's The Sultry Chef stall in Mezza Norte. So equipped with a jar of Super Tuyo Famous Spicy variant, I thought of giving this dish a dry run in the kitchen. Cook your pasta according to package and set aside. Don't wash it off on running water, by the way. Just let it sit in the cooking pot until sauce is ready. Heat butter in a pan and sauté the garlic until slightly golden, then add the shredded tuyo fillets and diced tomatoes. Add the chilies or red pepper flakes. I skipped this though, as I'm already using tuyo fillets from Super Tuyo's Famous Spicy variant. Season based on your preference. When the tuyo fillets have already melded in the sauce, turn off the heat and add some olive oil. Put pasta (straight from the cooking pot) to your spicy tuyo sauce and mix well. You can add in some grated Parmesan cheese and some basil leaves. As for me, I prefer to garnish my pasta with more tuyo fillets. This pasta dish is one of the simplest I've ever had to cook, yet it tastes amazing especially if you're a fan of spicy tuyo. I seriously can't stop eating forkful after forkful, and this in itself is just the plain version. If you have some shrimps, you can also add them into the mix and make a Spicy Tuyo and Shrimp Aglio Olio. Now, that sounds fancy! Since I've already mentioned Super Tuyo, let me go all out and make a quick review. I was given these 3 jars to sample -- Famous Spicy, Original and Sweet and Spicy. All 3 of these variants have tuyo fillets in garlic and oil. However, I'd say my favorite would be the Sweet and Spicy one as it's perfect with garlic rice or on top of even just plain rice. It gives off a nice blend of sweet, spicy and savory flavors that I truly enjoyed. My second favorite would be the Famous Spicy. While it lacks the sweetness dimension, it definitely makes up for it with extra spice. 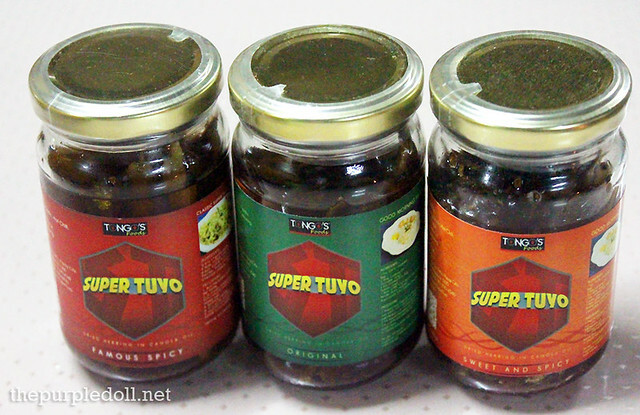 I think this is perfect for people who love their tuyo fillets really spicy, or if you'd want to incorporate a spicy tuyo into a dish (This can be good on pizza too! ), just like what I did with my Spicy Tuyo Aglio Olio. As for the Original, it didn't really excite my palate much and I'm not sure either where I can incorporate it. However, if you're a creative home-cook, I'm sure you'll be able to come up with something as my dull mind can only see this eaten with champorado. For more info on Super Tuyo, visit their Official Website, Facebook Page or Twitter. i've done this before! super sarap, one of my favorites. no fuss, simple yet very tasty. Sayang walang Super Tuyo here in Cebu. I'll try Rustan's or Ayala grocery tomorrow baka merong bottled tuyo that I can use for this. I am all for pasta dishes na hindi gumagamit ng conventional spaghetti sauce. Hehe! Looks yummy! I will try this at home, thanks! I love spicy tuyo pasta... I always order from restos. Ahh! I love Tuyo! :) Might as well try to do the recipe at home! I love tuyo. this is a must try! Spicy pasta with tuyo. Sounds new and interesting. Gotta try this with warm salabat. looks good! I want to try it out... I love tuyo so much... and this is a good variation on the usual way of eating it. looks yummy!! variety of tuyo. wow very yummy and easy to do recipe! I love aglio olio! I like Tuyo especially on rainy days with sinangag! yummy! Spicy Tuyo and Shrimp Aglio Olio sarap partners with "bahaw" (kaning lamig) with hot kapeng barako ..haist sarap! I might try this dish this weekend. I can taste the saltiness of the tuyo. yum! My mom cooked this with few squizzes of lemon juice and its so good! Never tried this kind of pasta before, but would love to since I like to eat "tuyo" :) this food looks unique, and interesting. Yay! I will cook this for my mother in law coz she loves pasta, thanks for the recipe. Looks yummy! i love pasta and this is a new dish for me :) my family and i are tuyo lovers but we're so used to eating it with garlic rice... hope to see some bottled tuyo and have my mom cook this, hehe. just wondering if nao ang lasa nito? di ko pa na try ito makain eh (with pasta)...& saan kya sya pwedeng mabili ? This is yummy! I tried this na. Mukhang masarap.I'll try this recipe.